Meet us Saturday January 12 for a FoF Recycling event from 10:30am to 12:30pm at Vectra Bank 361 US Hwy 24 in Woodland Park. ONLY donations of aluminum cans will be accepted at this time. Money raised will fund Focus on the Forest to develop a recycling program in the Woodland Park area. This new recycling program hopes to expand to accept items that are not easily disposed of or recycled at this time. Sat 11/3 10am - ? Join us as we continue to work on the hot spots that we were unable to complete during the last cleanup.and before winter sets in. Should be a beautiful day for cleaning up a variety of sites that have been reported to FoF that need attention before winter sets in. 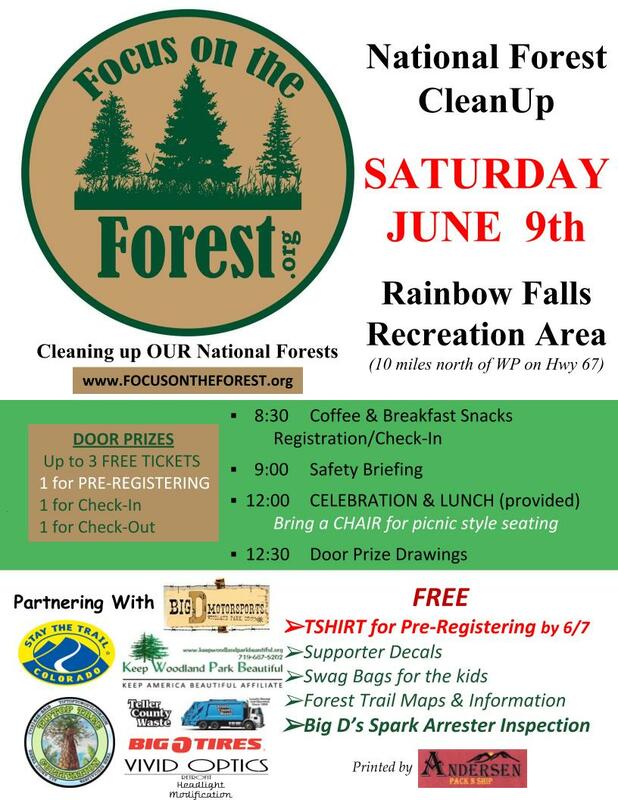 CleanUp Location: CR 300, CR 320, CR 323 and a variety of small forest service roads. Come join FoF TriLakes Chapter and spread the word about FoF with locals. Wear your FoF shirt to raise awareness. Sign in at the town's table when you arrive but also over at the FoF TriLakes table. https:/www.csindytickets.com/events/52390762/creek-week-2018 and select the Monument cleanup to register. Come support Focus on the Forest and cheer for our covered wagon entry in the Bronc Day Parade in Green Mountain Falls on July 28th, 2018 from 10:00 am to 11:00 am. Help Focus on the Forest convert the compactor to a Covered Wagon for the Green Mountain Falls Bronc days set for July 28th 2018. We will be decorating our wonderful compactor at the Woodland Park Middle School parking lot on Friday July 27th from noon to whenever we finish.Come and have a good time.